Metrics Service Management Offering - Cost containment and productivity are keys to the success of every CIO and Information Techology function. In today's busiess environment ROI is king and ways to measure are the key. What good is technology if it is not cost effective and does not provide a competitive edge. Metrics are necessasry to management and Key Performance Indicators (KPI) are required to show C-Level and operational management that IT is doing its part. .
Once something is measured it changes. What is accomplished both in good and bad ways. 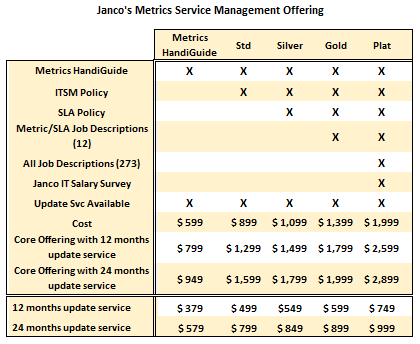 The metrics that Janco Associates have created in placed in it Metrics HandiGuide are based on best practices of over three dozen world class organizations. Key Performance Indicator (KPI) Metrics HandiGuide is over 300 pages, defines 540 objective metrics, and contains 83 Metric reports that show over 220 objective metrics. An Adobe PDF document with electronic bookmarks. 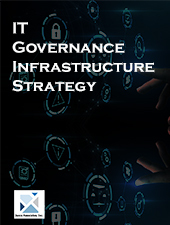 ITIL and ISO 20000 Compliant. IT Service Management Policy Template (Word) is an 126 page document that contains standards, policies and procedures, metrics and service level agreement for the help desk, change control, service requests, blog / personal web site, and travel and off-site meetings. It also contains a Change Request Form, Business and IT Impact Questionnaire, and an Internet Use Approval Form. Service Level Agreement Policy Template (Word/PDF) defines a three tier environment and specific SLAs metrics that are both internally and externally focused. The sample contain over 70 metrics presented graphically in PDF format. Metrics, Service Level Agreement (SLA) and Outsourcing Job Description Bundle includes 12 full job descriptions in WORD and PDF formats. They are: VP Administration; VP Strategy and Architecture; Director IT Management and Control; Manager Contracts and Pricing; Manager Controller; Manager Metrics; Manager Outsourcing; Manager Service Level Reporting; Metrics Measurement Analyst; Quality Measurement Analyst; System Administrator Unix; and System Administrator Windows. Internet and IT Job Descriptions as individual files in Word formats. Long file names have been used to make customization easier. Latest IT Salary Survey for 73 positions in all major metro areas in the US and Canada. The investment that you have made is acquiring this bundle can easly be protected with the the 12 or 24 month update service. With the update service you will be automatically notified when any of the products that you have ordered are updated. Using your credentials you will be able to down load the update immediately.